Home » Bed Reviews » Sleep Number Bed Reviews – Which is Best for You? Sleep Number Bed Reviews – Which is Best for You? Every Sleep Number air bed is completely adjustable with the click of a button. 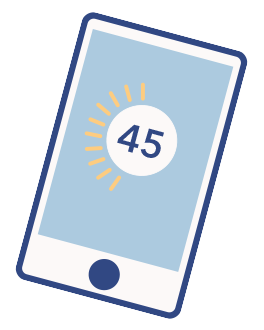 With either a remote or your Sleep Number app, you can adjust the amount of air in the air chamber to find the perfect firmness level that works for your body, a.k.a. your “Sleep Number setting.” An additional perk is that each side of a Sleep Number bed is adjustable, making this a great option for couples who have different comfort preferences. Lastly, Sleep Number beds come in a handful of models, from firm mattresses to super soft ones. Sleep Number also has a smart bed line, called their 360® series. The main feature that comes with these beds is Responsive Air™ technology, which does what it sounds like: The mattress will sense your movements and respond to them, automatically adjusting the bed’s level of firmness and support. The technology works thanks to the pressure sensors in the air chambers. 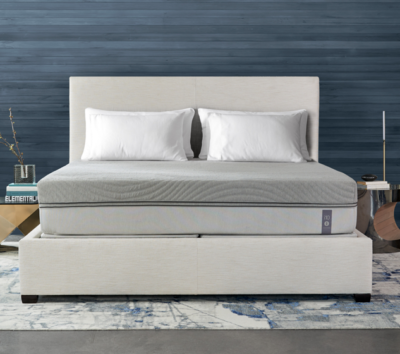 Additionally, every mattress in the 360® line includes SleepIQ technology, which uses sensors inside the mattress to track movement, heart rate, and more, so you can better understand how you’re sleeping and make important adjustments if needed. You find this out through your “Sleep Score,” which will be one of the first things you see when you wake up. In this article, we’ll dive into all the different types of Sleep Number beds, along with what might work best for you! Like I mentioned above, you can adjust your mattress to the exact firmness you need, which means you’ll end up with a specific number between 1-100. Sleep Number calls this, unsurprisingly, your “Sleep Number.” A Sleep Setting of 1 would be incredibly soft and 100 would feel like sleeping on a floor. Most people have a Sleep Number between 30-60. All of this works thanks to Sleep Number’s Firmness Control™ System, which includes the remote, air hose(s), and pump. In most cases, if you have a Queen-sized bed or larger, then you’ll have two separate air chambers and you and your partner can adjust each side to your personal preference. If your model has a Double-size option, then you can choose if you’d like your bed to have one or two air chambers. There will also be a hose that passes through the opening of the mattress cover, which connects to the air chamber. It stays happily hidden inside the mattress, with access through the zippered opening. Pay attention to how the bed feels. Sleep Number recommends bringing your setting up to 100 to understand what that feels like. Then, as the number goes down you’ll feel the bed get softer. Pay attention to how your body feels and reacts as the air chamber deflates. Choose a setting and stick with it for a few days. The moment your body feels like it hit that sweet spot, press Enter or Stop on your remote or app. The setting will automatically save so you don’t need to adjust anything. From there, try it out for a few days. If you’re finding that after a few days something still doesn’t feel totally right, you can try adjusting your Sleep number setting 5 or 10 notches. Which Sleep Number Bed Is Best? Now to the real meat of it! Here is a breakdown of every Sleep Number bed so you can figure out what is best for you. The C “Classic” series beds will be the most affordable option, but also the most limiting. These beds will be on the firmest end of the spectrum and come with the least amount of bells and whistles. Still, this could be a great option if you’re on a budget but still want the ability to adjust the level of air pressure in your mattress with the click of a button. The c2 bed does not come with a foam mattress pad on top of the air chamber. (All other Sleep Number mattresses come with a Comfort Foam layer.) Instead, it has a soft fiberfill sewn into a thin layer right above the air chambers. This is a great option for people who love firm beds — especially side sleepers. Many reviewers said the bed did a great job at helping alleviate back pain by providing ample and firm support. Other’s spoke to the bed’s longevity and a few were happy with the price point being more manageable than comparable beds (they start at $499.99). 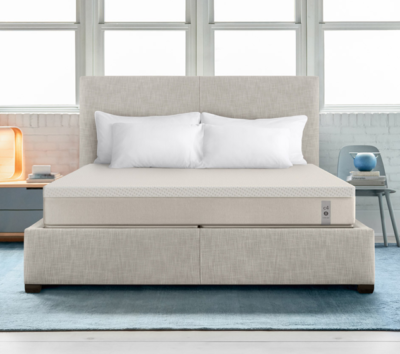 Lastly, the c2 includes a Core Line 25 Year Limited Warranty, which means any damage to the bed due to a manufacturing or material issue will be covered by Sleep Number for the first two years. After that, a percentage of the cost will be replaced or refunded up to 25 years based on the type of damage reported. The c4 model is pretty close to the c2. However, this mattress includes an added comfort layer to provide body contouring. 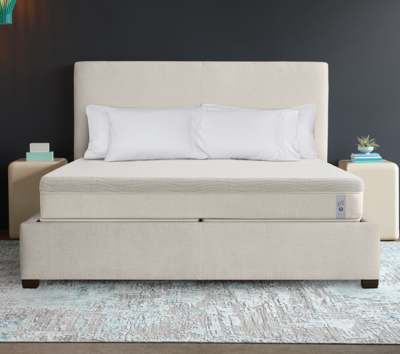 The mattress itself a little bit thicker than the c2 (10” vs 8”) and has specific technological integrations to make it compatible with SleepIQ® technology, which records and monitors your sleep activity via sensors inside your mattress that track movement, heart rate, and more. This feature is sold separately, however. A handful of people said the c4 provided good hip and back support, but they wished the comfort layer was a little thicker. This bed isn’t as firm as c2, but it definitely is still really hard. Of course, you can always adjust your sleep number to soften the bed, but you won’t be feeling a lot of plump cushion from the relatively thin comfort layer. For what it’s worth, people said the comfort layer was super comfy, they just wanted more of it. For comparison, mattresses that have similar qualities include the Loom & Leaf memory foam mattress, which also has the thin layer of foam specifically designed for pressure relief, and the hybrid mattress WinkBed, which is a firm bed with a pillow top layer for pressure relief. If you know you like firm beds and want pressure relief for your head and neck, the c4 could be a good option. The P “Performance” beds are some of the most popular Sleep Number beds. This is likely because they fall right in the spectrum between soft and firm, making it an all-around great option for any sleep position. However, there are some key differences between the two beds. The 360® p5 bed has “pillowtop style” comfort layer, meaning there’s an added layer of soft padding stitched to the mattress top. Right above the air chambers is four inches of PlushFit foam, which is designed to relieve pressure on five specific parts of the body: head/neck, shoulders, lower back, hips, and feet. For comparison, the c4 only has 1.5 inches of comfort foam, so the p5 will feel significantly softer than the c4. This bed has a good reputation for balancing firmness and contoured cushion, along with having a reasonable price point. In fact, the p5 will provide a medium-level of firmness with specific contouring zones to relieve specific pressure points. 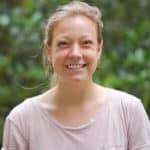 This is similar to a mattress like Casper, which has “Zoned Support Technology” or even a hybrid mattress like Purple, or a memory foam mattress like Leesa, both of which have cushioned support above the mattress. The p5 is also the most affordable Smart Bed option! To remind you, the main 360 series feature is ResponsiveAir technology that automatically adjusts the comfort of your mattress as you sleep based on movement. While the 360® p6 is a little more expensive than the p5, you get some extra features This bed comes with five inches of comfort foam (vs. four in the p5) and is also one inch thicker. Moreover, the p5 bed does not include a temperature regulating technology in the foam itself, while this bed does, helping to retain heat and keep you cool. This comfort layer has 5″ of foam that claims to provide pressure relief and temperature regulation. The types of foam, Coolgenex and Ergonomex, are neat, too. The Coolgenex is infused with graphite to draw the heat away from your body and behaves a lot like memory foam with contouring support and proper spinal alignment. The Ergonomex is a gel infused material that adds some extra support beneath the Coolgenex foam and a bit of extra comfort. Just like all the smart beds, the p6 has ResponsiveAir technology and connects to SleepIQ. Those who loved the bed pointed out how it stayed really cool throughout the night, and helped with overall aches and pains. The 360® i7 mattress is the only Sleep Number bed that is 100% memory foam. In fact, it has five inches of it above the air chambers. It also has cooling technology integrated into the foam so that mattress stays cool, something unique for memory foam. This bed bends towards the softer side of the spectrum, so if you like softer beds that work well for side or back sleepers. and enjoy smart technology, this could be a great option for you! The 360® i7 will feel very similar to other memory foam mattresses. Take the Loom & Leaf mattress, which has a similar mattress profile with medium-to-soft firmness and an emphasis on relieving pressure. Another good example is Bear mattress, which is a little more firm and great at temperature regulation to keep you from overheating. Reviews of the 360® i7 are generally good. People loved they could sleep on memory foam and not have the bed get too hot. Memory foam is known for contouring specifically to your body, and many manufacturers claim it can help with pain relief. Memory foam is generally great for side sleepers who need pressure relief on their hips, knees, and shoulders, and users said they felt a difference after sleeping on the i7. The “I” in “i8” stands for “innovation” pointing to the temperature-balancing technology included inside the mattress. This bed will be super soft, thanks to a 6” foam comfort layer made up of two different types of foam to promote contouring, support, and pressure relief. It also has cooling material in the surface that grabs heat and transfers it to the foam so the surface of the mattress stays cool to the touch. If you like softer beds (hi side or back sleepers!) have some money to spend, and really appreciate data, this could be a good option for you. As for the mattress itself, the 360® i8 mattress is softer than many Sleep Number beds, thanks to that 6” of comfort foam. Moreover, many reviewers rated the 360® i8 higher than other Sleep Numbers because of the lack of motion transfer (which is when you can feel someone else rolling around on their side of the bed). A lot of couples talked about the fact they had a very different Sleep Number from their partner, and happily and peacefully slept on their side without any disruption in the night. While not everyone was completely satisfied with the i8, most folks talked about the bed providing great pressure relief. The foam is designed to contour to seven areas of your body to relieve pressure, from your head, shoulders, lower back, hips, to knees, lower legs, and feet. This is definitely a soft, cool, and tech-friendly sleep option. 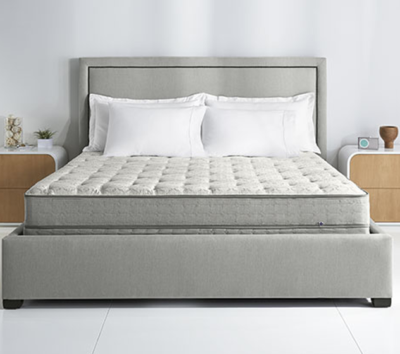 Out of all the Sleep Number beds, the 360® i10 is the heftiest if you look at its size, comfort foam layer, and price tag. The i10 comes with the thickest layer of comfort foam out of all Sleep Number mattresses, making it the softest and tallest bed. It has a generous 7” of contouring and advanced temperature balancing comfort layers. To get into the specifics, the comfort layer is made up of two different types of foam — ThermaLux™ and Ergonomex™. These promote contouring, support, and pressure relief. ThermaLux™ foam is a combination of foam infused with ceramic to provide temperature balancing benefits. It also doesn’t get stiff in cool temperatures, something traditional memory foam is susceptible to. Below the ThermaLux™ layer is the Ergonomex™ foam, which is infused with a swirl gel; the gel is known to contour more closely to the sleeper. The i10 bed is going to feel really fluffy, cushioned, and soft, with a focus on high levels of pressure relief and comfort. This is thanks to the seven inches of comfort foam on top of the mattress. However, a lot of people said the foam on top has just the right amount of sink in softness; overall, it sounds like having a firmer sleep number setting coupled with the comfy comfort foam balanced out softness and support quite well. If you’ve ever slept on a Purple mattress, Helix mattress, or Sapira mattress, all of these beds utilize similar pressure relief and cooling-foam properties, providing a similar feel to the 360® i10. 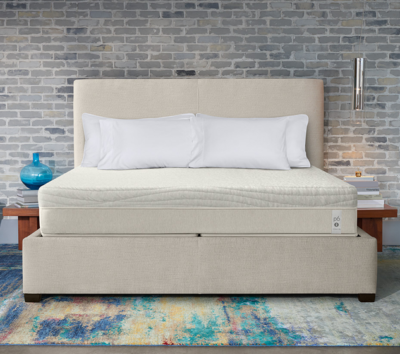 It goes without saying that this bed — along with all the other 360® models — come with ResponsiveAir technology, integration with Sleep IQ, and the option to buy an adjustable base. Let’s move to the bases now! See All The Details Sleep Number in My 360® i10 review. Sleep Number bases are sold separately. 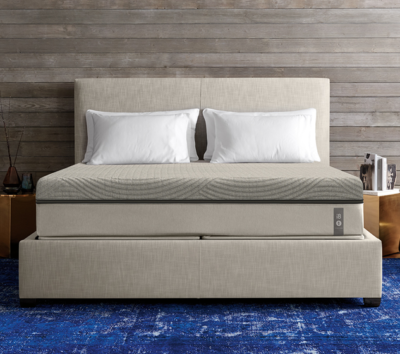 Luckily, there are a handful of Sleep Number bases to choose from, plus the company also recommends other types of bases that will adequately support your mattress if you want to use your own. Sleep Number mattresses come in all standard industry mattress sizes and will fit into traditional frames. 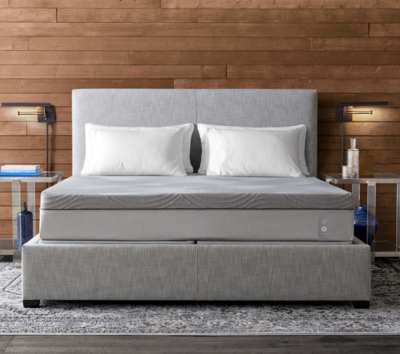 Here is a breakdown of the types of Sleep Number bases you can purchase alongside your mattress, or read an entire breakdown in my recent article about Sleep Number bases and alternatives. FlexFit™ 1: This is the most basic Sleep Number adjustable base, allowing you to raise the head of your bed. This is a good option if you enjoy reading or watching TV in bed before going to sleep. FlexFit™ 2: This base allows you to raise the head and foot of your bed. You can also gently raise your partner’s head if he or she starts snoring. You can also set a timer so the bed automatically returns to your favorite sleeping position at a certain point in the morning or night. Lastly, the base provides a “zero-gravity” feel as it moves, to replicate the feeling of weightless floating. FlexFit™ 3: The FlexFit 3 adjustable base includes all the features of the FlexFit 2 in addition to a massage feature, under-bed lighting, and a foot warming feature. Sleep Number says you fall asleep faster if your feet are warm! If you’re not buying a base from Sleep Number, to make sure you have (or purchase) one that has a firm and non-spring foundation like a platform bed or bunkie board. The bases to stay away from include a bed frame with slats or a traditional box spring base. These don’t provide enough support for your air bed. 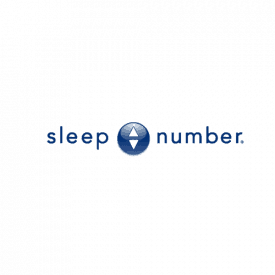 Sleep Number provides warranty packages for their various products. We’ll quickly review the Core Line mattress (c2 and c4) warranty, the 360 Smart Beds warranty, and the 360 Smart Bed remotes warranty. For the full story, read my detailed post on Sleep Number warranties. In a nutshell, Sleep Number will repair or replace your c2 or c4 bed if there’s a defect that isn’t caused human error. In other words, if something wrong happens to the bed that was due to a production error, that’s on Sleep Number. This will be completely covered for the first two years. From year 3-25 of the limited warranty, you will become responsible to pay for a portion of the repair and replacement cost. Sleep Number calculates the exact amount based on the “then-current” prices of each product. This warranty also covers the Firmness Control™ system that is a part of the mattress. Most of the same rules apply for the 360® smart bed warranty. Additionally, any tech-related issues that arise that are “related to defects in materials or workmanship with the SleepIQ module” will be covered. However, after two years, nothing related to SleepIQ will be covered. The remote for the 360® series actually comes with a different warranty! Similar to the other rules, if there’s an error made on Sleep Number’s side, your remote will be completely covered for the entire two years. After two years, any damages will be 100% replaced by the owner. Here are the most common compliments and complaints about Sleep Number beds, from the customers themselves! You can also read more in my common complaints blog post. Great for partners! This bed is a great option for couples, especially those who have different sleep styles and preferences. The DualAir feature means each side of the bed can be adjusted separately so you can sleep exactly how you want to without having to compromise with your bedmate. Breakdowns. There is a decent amount of set up and technology that comes with a Sleep Number. Because of this, the bed is naturally susceptible to breakdowns, including especially air deflation and broken pumps. A handful of customers also said their mattress cover started to fall apart after a few years. The site has a good support section with videos and content to help troubleshoot issues, yet many unhappy campers spoke up about things breaking down every few years. Trench effect. The most prominent complain throughout all Sleep Numbers reviews was talk about the “trench effect,” which is when the bed sags in the middle and one or both people on the bed slide into it. Because most Sleep Number beds come with two air chambers (so each person can adjust their side to their liking), if one side is significantly more firm or soft than the other, the bed is uneven and is susceptible to a sag in the middle. Price. The c2 and c4 Sleep Number prices are comparable to other foam or spring mattresses, with their Queen coming in around $800. Yet the prices go up once you move into the smart series beds. (Read my entire post on a Sleep Number price breakdown.) The adjustability and technological aspects of the bed hike up the price, so make sure these features are a must-have for your dream bed. Sleep Number comes with a diverse line of beds that suit many different people, styles, and sleep positions. From super firm beds to super soft ones, to interesting sleep technology and adjustable base add-ons, there seems to be something for everyone. Just get ready to pay for it, and be careful of breakdowns and troubleshooting.